. . . . from John, awaiting Nancy’s draft of her week’s news. Many years ago, nephew Rod was stationed at Naval Air Station Pensacola near the western end of Florida’s Emerald Coast. Thus, this location caught my attention. The town of Fort Walton Beach is along that stretch and is home to 3 Cash Moore Liquor Stores. 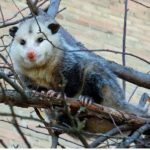 Another resident of the Emerald Coast is the Virginia Opossum. Opossums are skilled climbers. Awesome the Possum got into the rafters of a Cash Liquor store and came down onto a shelf holding bottles of bourbon. Oops! With a broken bottle on the floor and a thirsty Possum, and nothing better to do – Awesome got snockered. In the morning the police were called to take the tipsy marsupial into custody. She was taken to the Emerald Coast Wildlife Refuge, sobered up, and released. This is funny, except to the on-site folks that expected something different. A second day of explosions finally got the Pontiac Silverdome to collapse. Embarrassing, might be the word. Hultquists and Brittanys go back a few years. In about 1959, give or take a year, John’s oldest brother Ken bought a liver&white Britt. Shortly after that, John saw his first “point.” The bird was an American Woodcock (some call it a Timberdoodle). These have a long bill, and are related to the Common Snipe. The eggs are buff-colored and mottled with brown. Very pretty. An Auburn trained dog has followed the path of an individual across the campus a day after the person passed, after thousands of people had crisscrossed the area. 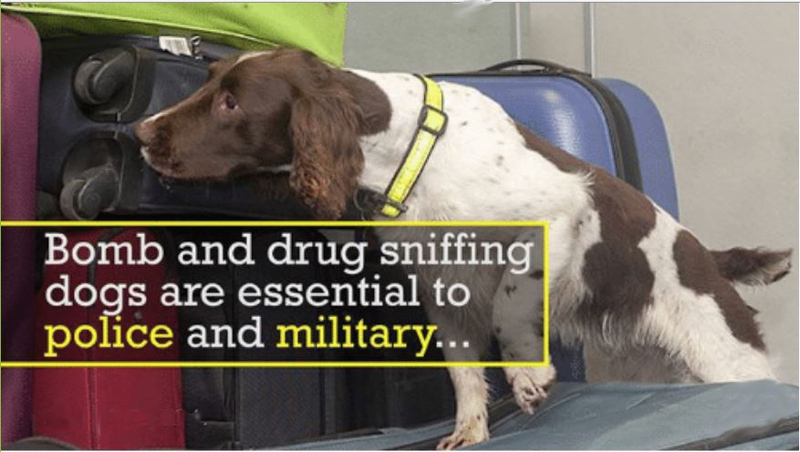 The ability of dogs to discriminate among smells and be trained to alert handlers to some situations (drugs, explosives, people — alive or dead) makes them the go-to-choice when a nose is needed. Why then does the USA mostly rely on imported dogs for these activities? There are several reasons – and we and our many friends in the Brittany world understand.